The envelopes are sealed, the statuettes are being buffed and the red carpet is at the cleaners – the finalists for the PNC Bank Non-Profit Awards have been announced. Presented one month from today (Feb. 28) by 2-1-1 Broward at Seminole Hard Rock Hotel & Casino in Hollywood, the fourth-annual ceremony celebrates the county’s local groups and leaders in the glamorous style of the other Hollywood. • Seminole Hard Rock Hotel & Casino Outstanding Non-Profit Organization of the Year: ARC Broward; Broward Partnership for the Homeless; and YMCA of Broward County. • Broward College Non-Profit Leader of the Year: Kim L. Cavendish, Museum of Discovery and Science; Dr. Steve Ronik, Henderson Behavioral Health; Dennis Stefanacci, ACFRE, Broward Health Foundation; and Patricia Zeiler, Downtown Fort Lauderdale Transportation Management Association. • Community Foundation of Broward Non-Profit Board Leader of the Year: Joe Rogers, ChildNet; Jan Vrins, Covenant House; and Heather Geronemus, Mothers Against Drunk Driving. • Nova Southeastern University Non-Profit Organization of the Year – Arts: ArtServe; Florida Youth Orchestra; and Art and Culture Center of Hollywood. • The Wasie Foundation Non-Profit Organization of the Year – Collaboration: Florida Hemophilia Association; Kids In Distress; and KidSafe Foundation. • Brown & Brown Insurance Non-Profit Organization of the Year – Innovation: Broward Children’s Center; United Way of Broward County MISSION UNITED; and South Florida Community Land Trust. • Calvin, Giordano & Associates Non-Profit Organization of the Year – Rising Star: Firewall Centers; FLIPANY; and A Prom to Remember. • Children’s Services Council of Broward County Collective Impact for Youth Award (new award): Crockett Foundation; HandsOn Broward; and HANDY. • OK Generators Lifetime Achievement Award: Anthony Karrat, Esq., Legal Aid Service of Broward County; Marcia Barry-Smith, Russell Life Skills & Reading Foundation; I. Lorraine Thomas, Children’s Home Society; and Dr. Susan Widmayer, Children’s Diagnostic & Treatment Center. • Tijuana Flats – Just In Queso Award (new award): Organizations not chosen as finalists in other categories will be selected by the Just In Queso Foundation team. • Publix Community Choice Award: Organizations not chosen as finalists in other categories will be elected by members of the community, who can cast their vote for the non-profit of their choice online at 211-broward.org. The nominees were announced Jan. 16 at a private party presented by Broward Health at Passion Nightclub at the Hard Rock, attended by sponsors, nominees and this year’s event co-chairs: Shane Print, vice president, business manager with PNC Bank; Susan Renneisen, vice president of community affairs and special events for the Seminole Hard Rock Hotel & Casino; and Jen Klaassens, vice president of programs for The Wasie Foundation and 2-1-1 Broward board member. Winning individuals and organizations will each receive a $1,000 grant to their organization. Up to two finalists per category will each receive a $500 grant to their organization. The Feb. 28 festivities begin with the Memorial Healthcare Service Red Carpet & Wizard Creations Finalists Celebration at 11 a.m., followed by a luncheon and awards ceremony at noon and an “After Party” at 2 p.m. sponsored and hosted by SIROCCO Mediterranean Restaurant & Lounge, in Seminole Paradise at the Hard Rock. Ticket Prices are $75 per person for general admission, $65 for FPL CLUB 2-1-1 members, and $50 per person for non-profit staff/government representatives. Tables of 10 are $750 and Table Sponsorships begin at $1,250. Partnership Opportunities ranging from $1,250 to $10,000 are still available. For ticket purchase or sponsorship opportunities, please contact Tracy Schuldiner at 954-390-0493 or tschuldiner@211-broward.org. 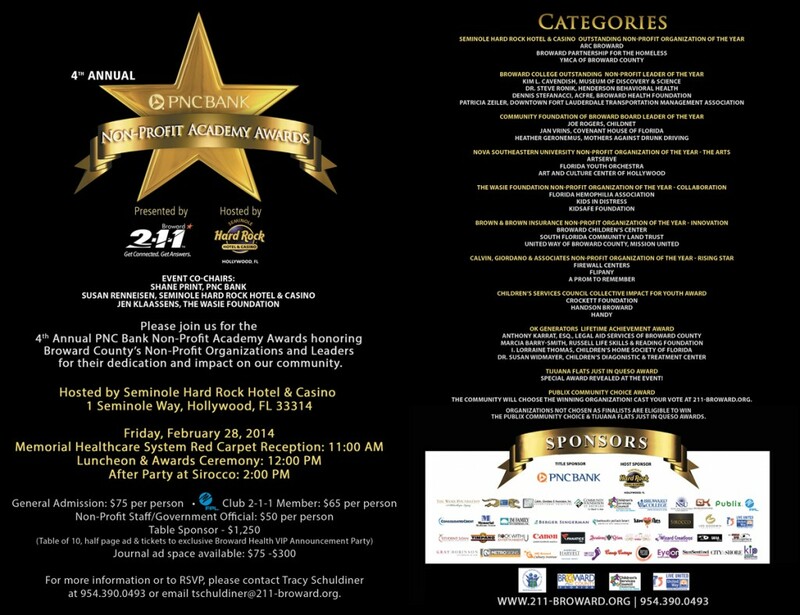 Follow 2-1-1 Broward at facebook.com/211Broward, or @211Broward and use event #211PNCHardRockAwards. For more info about 2-1-1 Broward’s 24-hour comprehensive helpline and community support services, call 954-390-0493 or visit 211-broward.org.